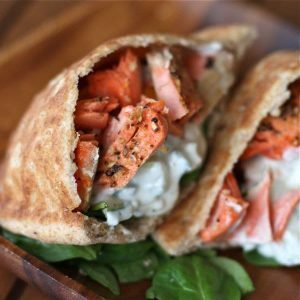 Broiled salmon is a heart-healthy seafood option, and one of my favorite easy salmon recipes are these broiled salmon gyros! Do you remember that amazing Cucumber and Feta Greek Yogurt Dip I posted about last week? Well, it’s back. It’s back in the form of a “sauce” that elevated what started as very everyday broiled fish and veggies for dinner into a pita sandwich that just screamed – awesome. I ended up making up a second batch of the dip recently. I wanted to have it in the fridge for hummus and veggie pita sandwiches, and for something to dip my carrot and celery sticks in when I experience a snack attack. In addition to all that, it became an amazing topping to these really tasty and super easy broiled salmon gyros. This easy gyros dinner whipped itself up so fast that it’s going to definitely happen again in my kitchen real soon. My husband’s words after eating the broiled salmon gyros: “You ARE going to put this recipe on the blog, right?”. These broiled salmon gyros make for a healthy light dinner. They are so easy to put together and you can’t help but feel great after eating them. 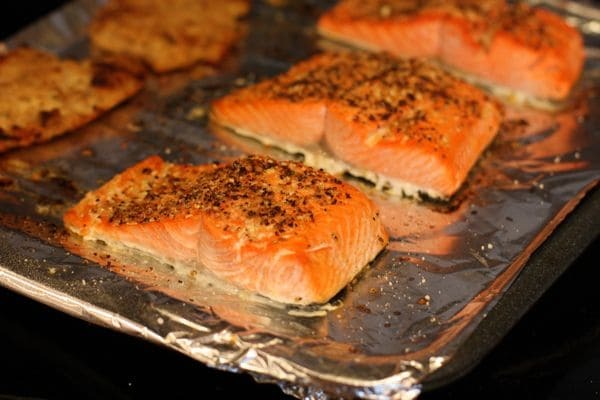 Place salmon filets on lightly greased aluminum foil lined broiler pan or baking sheet. Pat salmon filets dry with a paper towel, then sprinkle liberally with your favorite lemon pepper seasoning, salt and pepper. Drizzle a little olive oil over each salmon filet. Place under broiler and cook for 8-10 minutes or until salmon is turns lighter pink and flakes with a fork (cooking time for fish always depends on how thick your fish is). Set aside. Start assembling your “gyros” by splitting and opening your pita pockets and stuffing with spinach leaves, sliced pepper and onion, and a tablespoon (or two) of Cucumber and Feta Greek Yogurt Dip. 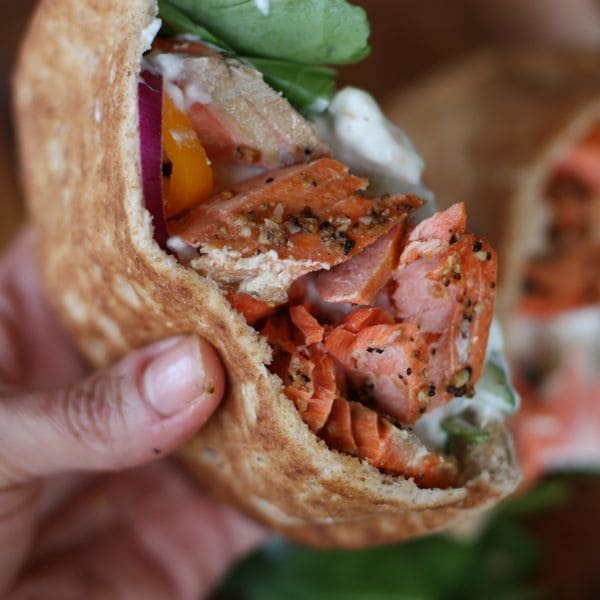 Take your salmon and gently flake into large pieces and place into pita sandwiches. Squeeze fresh lemon over salmon pitas and enjoy. Looks really delicious Aggie! We love our salmon around here. Need to make this. You definitely need to make it Jamie. I think Mike would love it! Thank you! I usually ask him the same question, lol. So I’m extra happy when he offers it first!! Perfect, healthy and delicious meal! That dip makes the perfect sauce for this. The salmon is making my mouth water!! I found myself leaning in on that last shot Aggie. Want. Now. Well, that’s the prettiest thing I’ve seen all day! This is 1000000x better than a traditional gyro! And I absolutely love salmon so this dish is definitely screaming my name. Can’t wait to give this a try! Love everything about this – nothing is better than salmon with cucumber yogurt sauce!!! Yum. Yum. Yum!! Aggie, this looks wonderful. My hubby will drool over it. And, we had your peach salad yesterday. It was delicious! ooh i love a good gyro but could definitely get behind a healthier version! LOVE. THIS. The end. 🙂 What a great recipe. My family would be so excited if I put this on the table for them! Delish! Wow, I seriously am in love with this…I love gyros and I adore salmon!! It’s pretty much genius, Aggie!! Using salmon for gyros is a great idea! And I could put that sauce on everything. I should be getting a fresh batch of salmon from our hunters in the next week or so and I am going to make these for sure! YUM! that makes me 🙂 thank you! Oh what a great idea Aggie! Looks soooo good! These look and sound crazy good, and nice and easy too!